Wilton High School football coach Bruce Cunningham takes on Stamford at Fujitani Field in Wilton, Conn. Saturday, October 22, 2016. NORWALK — AJ Albano and Bruce Cunningham took rather different paths out of the head coaching ranks this season. Albano stepped down from his alma mater at Brien McMahon after a long reflective period where he looked at his program and what might be the next step for it. Cunningham’s exit from Wilton was swifter, happening quickly for “personal reasons” after the veteran coach became concerned how outside parental influence might try to dictate the future of the program. Both have landed safely at other jobs — assistant coaching roles with two of the state’s most prolific programs — and neither could be happier. Albano will be coaching the secondary at New Canaan, under legendary coach Lou Marinelli, while Cunningham returns to his alma mater, joining John Marinelli’s staff at Greenwich High School. Before Albano took the McMahon job, he was a a longtime assistant at Darien High — the Rams’ vaunted rival. 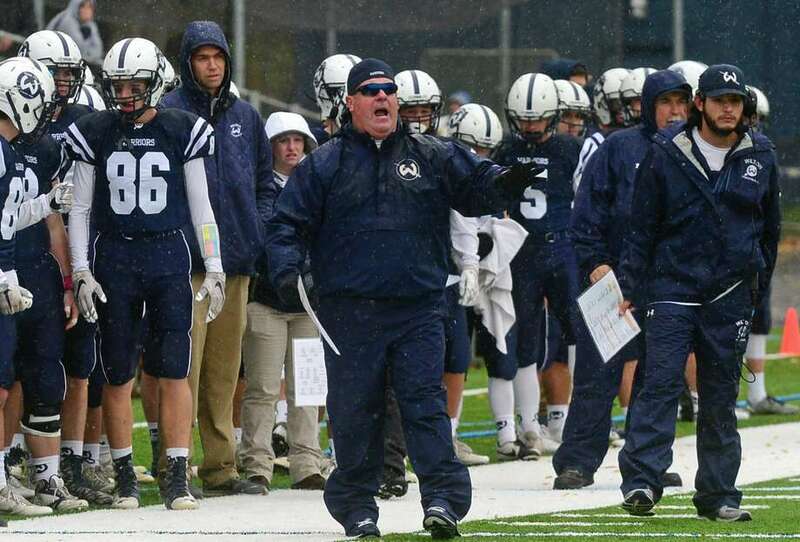 Darien wasn’t quite the program it is now, Albano said, and being so far removed from the players he once coached won’t make this year’s showdown weird. After a couple of strong seasons when McMahon just missed qualifying for the state tournament, the Senators hit a tough patch over Albano’s final three seasons. One of the coaches who reached out to him during those tough times was Lou Marinelli. When word reached Marinelli that Albano might be interested in joining his staff, he quickly pulled the trigger. The fact that New Canaan doesn’t play McMahon will allow Albano to continue to root from the Senators from afar, the coach added. In a strange twist of fate, Albano almost landed at Wilton with Cunningham. Cunningham’s decision to leave Wilton hurt, but the veteran knew leaving was the best thing for him personally. Going home will certainly help ease the pain. As Cunningham was dealing with the end of his Wilton coaching career, John Marinelli was one of the first people to reach out to him for support. The third-year coach said adding such a veteran coach to his staff was a no-brainer. Marinelli said Cunningham will be responsible for the defensive line on a day-to-day basis, but will mean so much more to all facets of the program. Cunningham is just fine with that. The head coach also knew what coming home meant to Cunningham. “I know his heart was in Wilton, but a piece of him was always in Greenwich, too,” Marinelli said. The elder Marinelli was impressed with his son’s latest hire, too. Once the head of their respective programs, two coaches are still a part of the team — just vastly different teams than where they left. John, I know you had a rapport with Bruce; however, let’s not forget what the “illustrious program” did to Coach Rich Albonizio….who built, maintained, and “gave his heart” to…..but then came the “It was a well-orchestrated sabotage. It got very ugly,” part of the program….. It is a great hire by Coach Marinelli and the Greenwich Football Program. Also shows how secure John feels as a head coach to hire someone to his staff with so much head coaching experience. Letting Albonizio go was a great decision by Greenwich. First of all they hadn’t even made states in 7 straight years which is almost impossible to do. Second in case you haven’t noticed Albonizio hasn’t been hired as a head coach since. Third he as let go as an assistant at Trinity. Forth Greenwich has made states for 2 of John’s 3 years. Although I wouldn’t argue ethically how right is it for Gus Lindine to fire someone who has been a head coach for so long. What’s the point of this article? Wasting time with guys who weren’t successful coaches and moved on. Honestly no one cares that AJ is a secondary coach at NC. Let’s get the coaching carousel article up or maybe an article on a feature player in the league or state..